SHEET, MOLD AND ROLL WITH ONE UNIT. SHEETER: With the exclusive variable speed feature, you can sheet puff pastry and Danish extra soft and extra rich from the very first roll. Sheet your cookie doughs and cut them right off the belt. No more guessing on thickness. BREAD MOLDER - It makes all types of bread-white, whole wheat, raisin and up to a 60% rye flour rye bread - from 6" hot dog rolls to 22" freanch bread at 30 loaves per minute. CRUST ROLLER - There are four rollers, not two. Roll your pies and coffee cakes in one smooth operation from one position. No more changing rollers or feeding from the back. Everything takes place in front of you. IDEAL FOR....Sheeting, Bread Molding, Pie Crust, Puff Pastry, Danish, Cookie & Pizza Doughs. FEATURING....Saddle/Molding Attachment, Variable Speed Control, Automatic Safety Bar. Enjoy the outstanding reliablity and versatility of the Acme Rol-Sheeter. the Model 88-6 features optional front infeed conveyor with cutter attachment and back infeed pan. 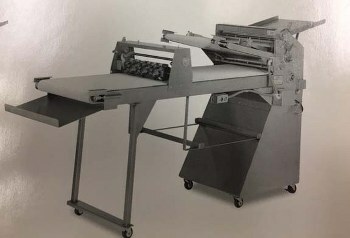 DOUBLE PAN INFEED: Ideal for sheeting large dough up to 18"-22"
FRONT INFEED CONVEYOR - BACK INFEED PAN: Allows an operator to sheet dough up to 18"-22" wide in one continuous operation. BACK INFEED CONVEYOR - BYPASS SCRAPER: Automatically runs through two sets of rollers in one continuous operation. Ideal for overhead proofers. Choice of 3 Pressure Plates: 5 5/8" through 22"